According to a raft of experts, empowering women to be economic actors would change quite a bit. The UN Secretary General set up a High-Level Panel on it; Melinda Gates keeps talking about it; and the World Bank and Ivanka Trump recently launched an initiative to unlock billions in financing for it. Targets related to women’s economic empowerment cut across multiple Sustainable Development Goals, including advancing equal rights to economic resources, doubling the agricultural productivity and incomes of women who are small-scale farmers, and achieving full and productive employment and decent work for all women. You are 20 years old. You live in a place where women get married young—when they are still girls, really—so you are already married. You gave birth to a happy baby girl about a year ago, and you have two older children, who are two and four. You wake up early to nurse the baby, and soon the bigger kids want breakfast, too. Your mother-in-law is there to help prepare food, but your supply of wood is low so the fire doesn’t last long. You strap the baby to your back and head out to the forest to gather wood. An hour later you return with a hefty load, and you’re happy that you didn’t have to go very far today. If this were you, you might feel bewildered if I asked whether you were “economically empowered.” This woman’s days are strongly dictated by the needs of her family. She may not feel that she has the power to make her own choices about money or livelihoods—or about much of anything. But what if she did have that power? What would that change—for her, and for the world? This could help all of us, not just poor women. Empowering women economically could reap astronomical economic benefits. According to a 2015 study by McKinsey & Company, achieving equal participation in the labor market could add $28 trillion to global GDP by 2025. What does it mean to be economically empowered? According to the International Center for Research on Women, “A woman is economically empowered when she has both the ability to succeed and advance economically and the power to make and act on economic decisions.” This definition has two important components: capacity, or the skills, knowledge, and resources that enable economic advancement; and agency, the ability to define and make choices. Capacity is relatively easy to recognize and define; it can include business skills, vocational education, or women’s cooperatives and savings programs. Agency, though, is a more difficult concept to pin down. External forces, such as societal norms and culture, shape not only the opportunities that are open to women, but also a woman’s perception of and expectations for herself. Each woman’s personal experiences and access to resources, such as education and health, contribute to her agency. Women’s reproductive lives are strongly linked to the way we experience agency. A woman’s ability to determine the number, timing, and spacing of her children is a form of agency in and of itself. In turn, having control over one’s own reproductive life paves the way for agency in other domains, such as education, participation in community life, and engagement in economic activities—all of which contribute to positive development outcomes. Women who have access to and use contraceptives have more decision-making power in the household, attain higher levels of education, and have greater rates of labor force participation. Older first-time mothers are more likely to complete school and participate in the formal labor market. Longer intervals between births and having fewer children increase rates of participation in the labor market. Women’s agency is woven throughout these findings. Nancy Birdsall at the Center for Global Development describes a “reproductive ecosystem”—that is, a combination of social norms, economic realities, laws and customs, and access to contraception—that affects girls’ and women’s agency. We need to study this ecosystem further and quantify its contributions to women’s economic empowerment. Given the promise that access to contraceptives holds for women’s agency and economic empowerment, recent proposals to cut funds for contraceptive programs, as well as debilitating restrictions like the expanded Global Gag Rule, would impede women’s progress. The message of women’s economic empowerment, however, may offer an opportunity for bipartisanship. In April, the U.S. House of Representatives Committee on Foreign Affairs passed the Women’s Entrepreneurship and Economic Empowerment Act of 2018, which among other things, seeks to “increase the capability of women and girls to realize their rights, determine their life outcomes, assume leadership roles, and influence decision-making in households, communities, and societies.” Introduced by Rep. Ed Royce (R-CA) and backed by an evenly bipartisan group of co-sponsors, this legislation could open the door for meaningful conversations about women’s agency and the factors that contribute to it. Now imagine you are 20 again. You still live where women marry young, but pregnancy is no longer a surprise. You and your spouse have made plans for the future, and the community health clinic provides counseling and contraceptives that help you choose the number, timing, and spacing of your children in ways that fit your family’s plan. By delaying your first pregnancy, you were able to finish school. You got a small business off the ground before your first baby arrived two years ago. Now you are taking accounting classes and planning to grow that business, hiring several of your friends and contributing to your family’s savings. You and your spouse agreed that a year from now would be the best time to try for a second baby. You still fetch wood and water, you still wash clothes, and your active two-year-old still scrapes his knees—but the demands are not quite so intense, and there is more space and time in the day for you to build on your hopes for the future. And that is good for everyone. Access to contraception alone is not a silver bullet for women’s economic empowerment. But it is a key tool for increasing women’s agency. As the act states, women’s economic empowerment is “inextricably linked” to other human rights, including “achieving the highest possible standard of health and well-being.” Access to contraception and reproductive healthcare provides a firm foundation for efforts to economically empower women; without it, such efforts are like building on sand. Kathleen Mogelgaard is a writer and analyst on population and the environment. 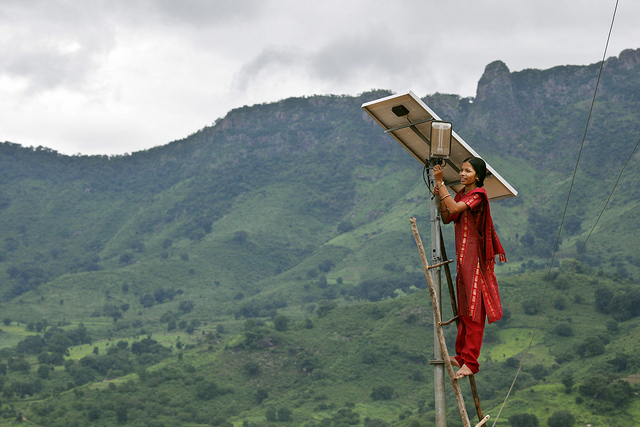 Photo Credits: Woman tends to maintenance work on the solar street lighting in her village of Tinginaput, India. September 2009. Courtesy of UK Department of International Development.